What are your salespeople getting right? What are your salespeople getting wrong? If your most important customers sat in on your sales training, what would they think? Sales organizations that keep doing what they’ve done are likely to keep getting what they’ve gotten – certainly not a recipe for success in today’s disrupted and time-challenged world. Moreover, most learners have been through sales training before and probably aren’t using the best practices that they were introduced to in the last iteration. Most of their leaders are not coaching them to use the best practices that have already been introduced, because the organization hasn’t been a serious attempt to equip them to effectively coach. Your sales team: Does your training equip your customer-facing sales teams with takeaways in the form of proven best practices, skills and tools that they can implement and use immediately? Your customers: Is your training focused on the pressures, objectives and challenges of your customers and helping them be successful through value co-creation? Your sales leaders: Do your sales leaders and managers emerge from your training energized and able to add value to the sales process by asking the right questions at the right times? If the answer to any of these questions is no, then the likelihood of obtaining a strong ROI on your sales training investment is diminished. Your salespeople and their leaders want to sell more, and their customers want more value for their investment. 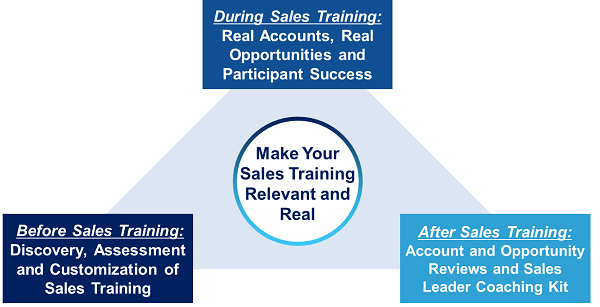 Organizations that obtain the greatest impact and mindset shift from their investment in sales training define their sales training continuum as having three actionable and measurable components: before sales training, during sales training and after sales training. Serious sales training initiatives should begin with a thorough discovery and assessment phase, which helps your trainers understand where the pressure points and priorities are for your sales organization and then customize training accordingly. Few will disagree with the advantages that customized sales training provides, and effective discovery and assessment in advance of training will help ensure that your content and approach hits the mark. Some sales trainers enter the room with the intent of focusing on their approach, which is fine if their content is a bullseye fit. But what if it doesn’t align with your unique business requirements, not to mention your three stakeholder groups? You won’t know until it’s too late to turn back, and your sales team won’t adopt new skills, because there won’t be a compelling reason to. The discovery and assessment process, if executed properly, will help ensure that training equips your salespeople in the areas that matter most to their success. The significance of using real accounts and opportunities (rather than case studies) during sales training can’t be overstated. When each participant enters training with a significant account and must-win opportunity to focus on, the likelihood of impact increases dramatically. When participants can immediately apply their learning to something their most important accounts and opportunities, they are able to see the results through their own personal success. When customers learn that you conducted sales training and that it focused on their pressures, objectives and challenges (as opposed to believing that the sales training was about tips and tricks on how to close deals), you both benefit. Collaborative exercises in which participants focus on their own accounts and opportunities can be energizing and provide the added benefit of creating an environment where salespeople can learn from each other, an effective means for transferring knowledge. As for sales leaders and managers, what could be more compelling than having your salespeople spend their time in training focused on the customers who will ultimately determine success? It’s a winning combination and a powerful motivator for active sales training participation by all. What could be more compelling than having your salespeople focus their training on the customers who will determine success? No matter how successful your sales training was considered to be, unless there is a mindset shift among the participants afterward, the adoption level will be low, and ROI will be disappointing. No one is better positioned to observe the post-training behaviors of their salespeople than their first-line sales manager or leader, yet when he or she isn’t equipped to drive adoption by asking the right questions at the right times about the right things, the opportunity to impact the learner’s performance is reduced. When deploying customized sales training against real accounts and opportunities, sales leaders and managers are in an ideal “laboratory” to examine the impact of training takeaways on achieving participant mindset shift. There is no better way to reinforce sales training than through direct engagement by sales leaders and managers afterward. By providing them with customized tools that facilitate the sales coaching process, you can dramatically increase the likelihood of adoption and sustainment. Combine these “coaching kits” with sales training content and exercises that are customized to fit the business and aligned with real accounts and opportunities, and you have a highly conducive environment for sales coaching and review, at both the account and opportunity levels. The sales landscape is changing rapidly, and companies and salespeople who fail to evolve to a more customer-focused approach to sales training risk being deemed less relevant by their customers. By launching your sales training initiative on the basis of effective discovery and assessment, conducting sales training with real accounts and opportunities, and equipping leaders and managers as proactive sales coaches, you create an environment to bring value to all three important groups of stakeholders: your sales team, your customers, and your sales leaders and managers. By taking a broader view of sales training before, during and after it is conducted, you have the opportunity to position your organization to deliver something real, relevant and more effective. There is no better way to reinforce sales training than through direct engagement by sales leaders and managers afterward. Steve Andersen founded Performance Methods, Inc. following a successful technology career that included multiple appointments as chief sales officer. He has numerous publications, including “Beyond the Sales Process: 12 Proven Strategies for a Customer-Driven World” and “The Keys to Effective Strategic Account Planning.” You can reach Steve at https://www.linkedin.com/in/steve-andersen-5442ab11/.